Heyyy…look at that! I’ve been forgetting to use, re-use, and/or re-design this handy little logo for this Weekly Haul "feature" I try to do! 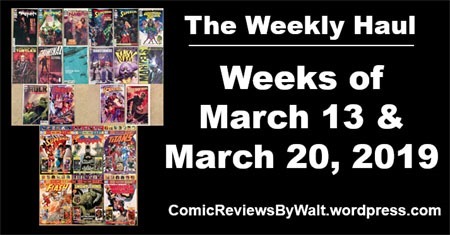 Anyway…medium-sized week for April 10, 2019. And for the first time in awhile, I think, it’s straight "big two" in DC and Marvel…though as-is-normal for me these days…Marvel‘s on the short end of things. 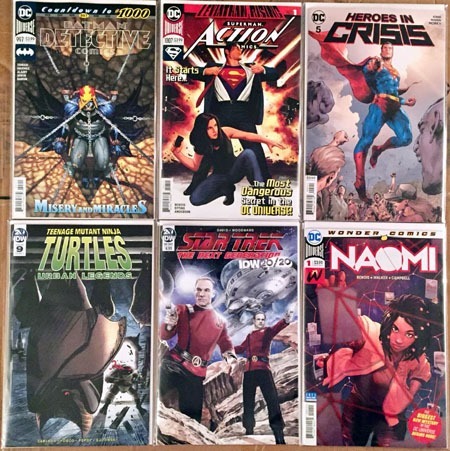 First up, the new Superman and Supergirl issues. It seems rather odd to have Supergirl at such a (relatively) high number compared to Superman, but that’s what you get when you have renumberings/reboots/whatever shenanigans! So, by the end of this year…Detective Comics will be "in the lead" in terms of numbering! This issue also sports a new logo! 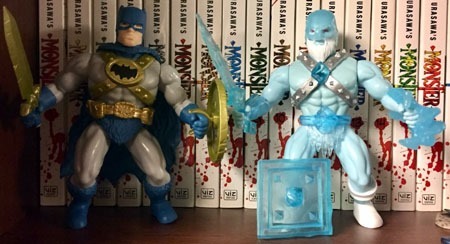 I’m not enamored with it–like a lot of other comments I’ve seen online, it reminds me of the Batman: The Brave and the Bold cartoon logo, and does look like it’d be more at home on a line of toys and/or animated tv show than this comic series. That being said…I think it ALSO seems rather out of place against the current Batman logo, which I may be "used to" but still don’t overly like. To me, the new Detective Comics logo would look a lot better if it better-matched the Batman title…and I’m more than ready for (I say this now, anyway) a new logo for that title. Next, we have the aforementioned Batman title. I’m not sure if this issue was "late" or what, but I’d swear the two titles were alternating weeks. 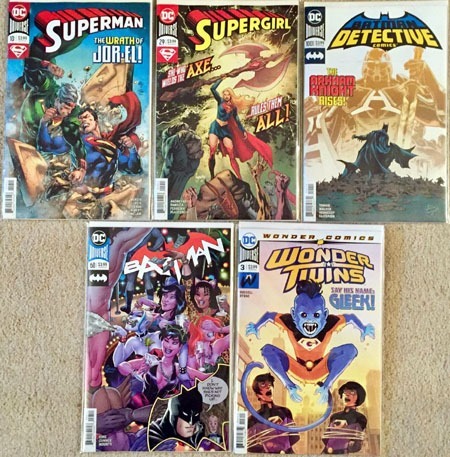 And here we’re "already" at Wonder Twins #3…and I still need to read the first 2 issues as well! 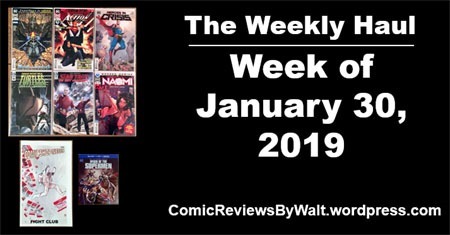 On to the Marvel titles…I suppose in my opening comment I neglected to mention that where Marvel has THREE issues I picked up on Wednesday…all three are reprints! Nothing "new!" 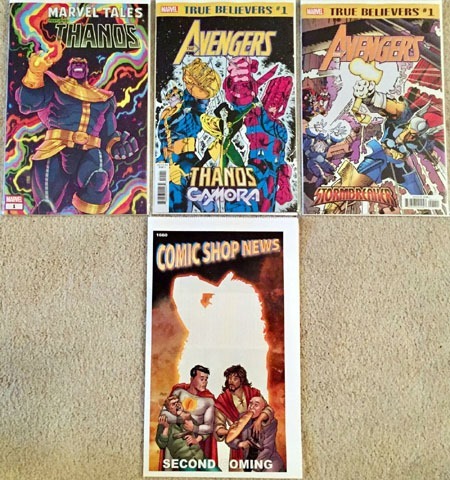 The Marvel Tales issue features Thanos and reprints Warlock #10 (his original series), Silver Surfer #45 (an issue that I covered a few years ago), and Warlock and the Infinity Watch #8. Incidentally, going from that, the True Believers Thanos and Gamora reprints Warlock and the Infinity Watch #9…the very next issue. And finally, True Believers Stormbreaker reprints Thor #339. 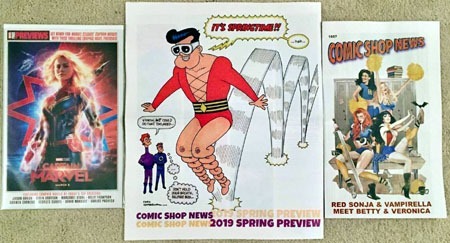 While I’m getting rather tired of the True Believers heading (I’d much rather $1 "facsimile editions" of these various issues), they continue to show (me) that Marvel is perfectly capable of putting out cheap(er) comics. AND that I overall really care very little for stuff they’ve published over the last 10-15 years (pretty much Avengers Disassembled to present). So reprinting stuff from the ’90s especially, as well as the ’80s and such…that’s where the bulk of my interest seems to be. 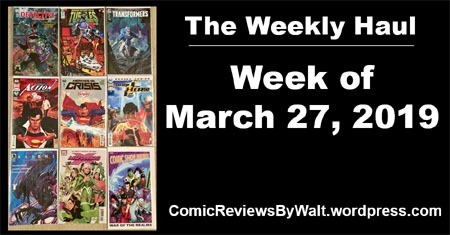 Finally, the week’s Comic Shop News features Second Coming. I’m not really sure what to make of it…it’s certainly gotten hype, and I might give it a try; though like most such projects, it strikes me as something probably better gotten as a collected volume rather than single issues. Time will tell! I’ve found myself "gearing up" again with a couple things. I mentioned Mortal Kombat with last week’s post, and that interest continues. The same week that Mortal Kombat 11 is due out, the first new Magic: The Gathering novel War of the Spark is also due out. 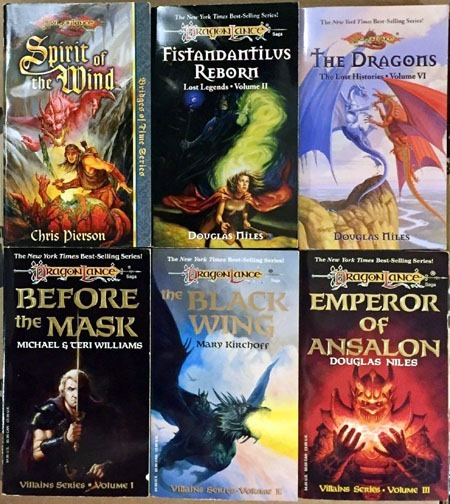 I find myself really hoping that even if they don’t "self-publish," that Wizards of the Coast gets back into doing regular novels for their various properties again…at least "core story" things. 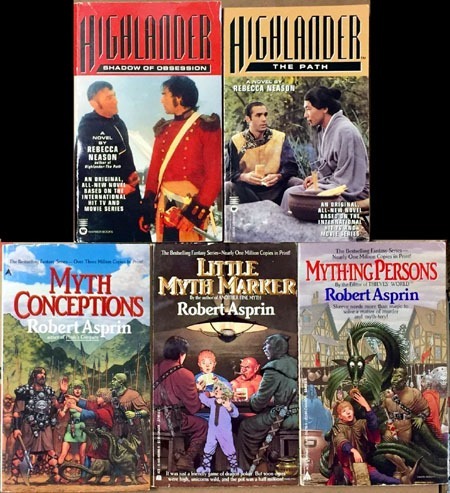 Maybe there don’t have to be new books every month delving into every side-character’s sibling’s personal history, but at least get a couple new books each year! I’d even settle for published versions of material they’ve released online! And there’s the Force of Will card game. I loved what I saw with it last year, but it fell to the side due to "real life stuff" getting in the way. I’m not really sure what "sparked" it THIS time around, but I’ve found myself getting some new stuff for it including a couple of "playmats" and such, and even impulse-ordered a "crate" of stuff thanks to seeing it on several YouTube videos. And when I read a description of another item a bit closer, realized that where I thought it included 72 cards, it actually includes 72 booster packs…which is basically two boxes‘ worth. For only a little more than twice what I paid for a "cheapo box" last year, and not much more than what I paid for another box (also last year). So while I may not have much of anything overly "special" from the game…definitely bulking up on cards, and hopefully will be able to get friends to play it with me. Though I’m also starting to re-consider my outright "boycott" of local gaming store(s). (Been refusing to do business with WPN gaming stores over their pricing of the Jace’s Spellbook product last year). However, even if I "give in" and seek out being able to play Force of Will at a game store, I fully intend to hold to NOT buying Magic: The Gathering product from the game store. Last week was both a small week and a HUUUUGE week! On the "HUUUUUGE" part, we have the 1000th issue of Detective Comics! My very first issue of the series was #604…which to some reckoning makes this the 396th issue I myself have been around for. 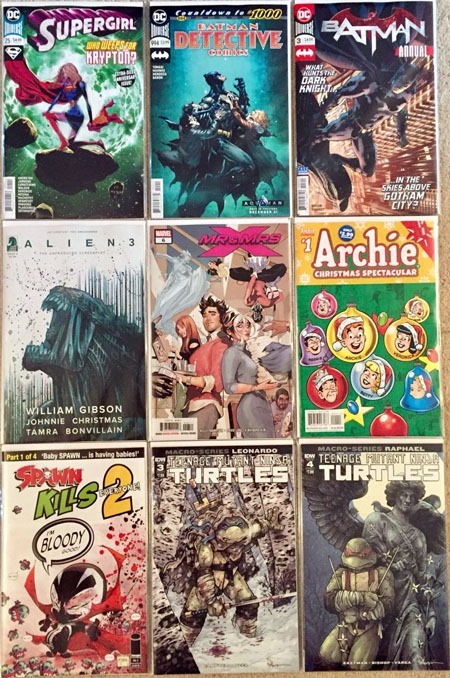 (398 if you count the two #0 issues, over 400 if you count whatever other titled out of sequence issues). Then there’s the latest issue of TMNT: Urban Legends, guest starring some of the Savage Dragon characters. 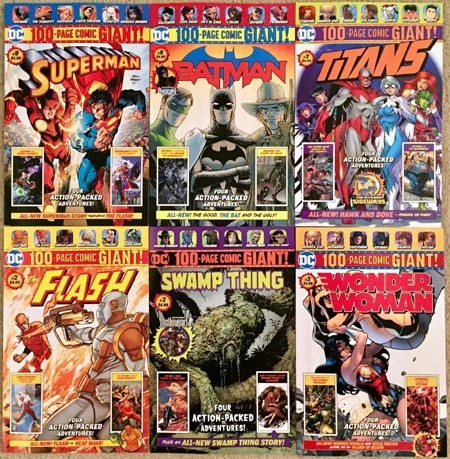 After all, this is the series that was originally published by Image, and I believe instigated at the time by Erik Larsen, creator of the Savage Dragon and associated characters. And there’s the second issue of the latest iteration of IDW‘s Transformers. Can’t say I’m all that impressed after reading the first two issues. Maybe it’s not bogged down with intricate continuity, but it’s not engaging me all that much. Next is the latest Action Comics, which I’m sadly a few issues behind on reading. I’m not terribly keen on stuff with this "Leviathan" branching out to a bigger event…overall, I’m just sick and tired OF events! Which brings us to Heroes in Crisis #7. I’m pretty sure this was supposed to originally BE a 7-issue series. While it obviously, literally has PAGES that prove its length, I feel like there still hasn’t been any significant STORY developments or forward movement. It’s like something that might be better suited for–I don’t know–a "web comic" series or something, with each of these one-page "interview sequences" serving as a "strip," and EVENTUALLY they all get collected into some print edition. I’ve thrown in with the Wonder Comics line…the latest premiere of which is Dial H For Hero. I’ve never particularly read any iteration of this title before, but do recall having an old ’80s issue, back in the early ’90s in my earliest days being "into" comics significantly. Where I’d figued the William Gibson Alien3 thing to be four issues, apparently it was 5 issues. Longer story is good…now to find 1-4 and read the whole thing in one sitting! Fitting in a way as the latest Alien thing for me to read. In 1992 or so, it was the novelization of the film that "hooked" me on the franchise, and that’s lasted 27-some years now! Finally, Mr. & Mrs. X #9…reminding me yet also once more again that I’m far too "behind" on reading, but quite enjoy Rogue & Gambit and so wanted the title. At this point I believe I can catch up on some reading even without locating all my single issues, thanks to Marvel Unlimited. I have some small hopes of getting a review of Detective 1000 up in the next week or two. In short, it was a nice, thick issue with lots to read, and took me several sittings to get through. I passed on all of the "decades variants," due to the price, primarily. 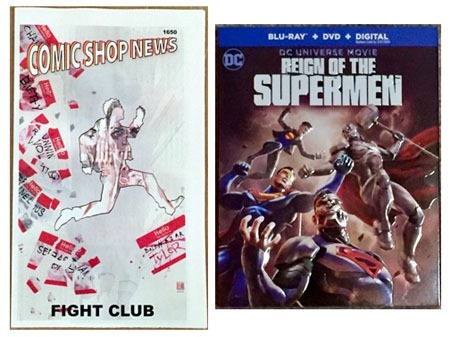 The ’80s and ’90s covers would’ve had me just for nostalgia of the classic "DC bullet" as well as the title logos themselves. But the image on the ’90s cover just wasn’t distinct enough or interesting enough to me. And the Frank Miller image has got to be one of the single UGLIEST cover images of a Batman I have EVER seen! I’m still trying to locate the Walmart Detective Comics 100-Page Giant issue…and it might be my "breaking point" on those, as I enjoy having EVERY issue. Miss one, break "the streak," and why bother with the others? But I also refuse to pay $15-20+ for a $5 comic…especially with the many Walmarts around here and the frequency at which I’m able to visit said stores. 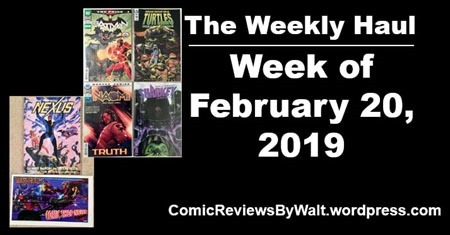 Though this post is for the March 27, 2019 books…here’s to the first week of April 2019–April 3rd–being a good week of new comics! 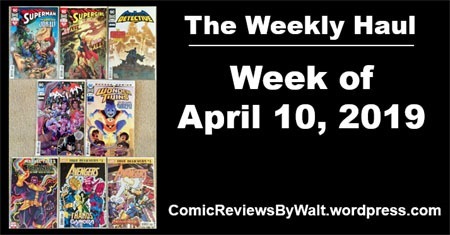 This past week was a rather large week, especially as single issues go. Maybe not huge, but large. Supergirl hits its 25th issue, which is an extra-sized $4.99 issue. Considering the series had apparently been cancelled for several months but came back with the existing numbering has been a huge selling point for me…and I’m willing to turn a “blind eye” to a $4.99 #25 much more than I am a #1! Though I’ve skipped several months’ worth of Detective Comics, I’ve opted to get back in for the run-up to #1,000. We’ll see what I think on that after I get around to actually reading #994, though!. While it seems most often that DC saves up its annuals for a 5th week, we get the Batman Annual this week, and it is another $4.99 issue. Again, I’m willing to accept that as this IS an annual, a special issue, and not intended as the premiere issue for a new series! Then there’s the second issue of the Alien3 adaptation from William Gibson; I haven’t read the first issue yet, and actually need to figure out where it wound up. 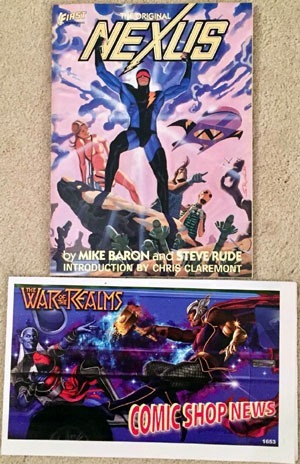 I probably “ought” to just wait for a collected volume at the rate I’m going, but then, I’m also preferring oversized stuff to skinny-as-heck paperbacks that fit in a comic bag and board that my regular comics fit in. I need to consolidate my Mr. and Mrs. X issues and read…but as a fan of Rogue and Gambit, and of Rogue and Gambit, it’s one Marvel series I’ll actually support. And at least conceptually, their being married is a welcome change, to me! And no particular interest for me in an Archie-published Archie special…buuuuuut it’s “only” $2.99 compared to virtually everything ELSE Archie publishes these days being $3.99 with umpteen variant covers. So I definitely wanted to support the $2.99 price point! And as always, the TMNT stuff has long been my “exception” on stuff…including pricing. $7.99 for each of these “prestige format”/squarebound Macro-Series issues doesn’t really phase me. The more good, in-continuity quality TMNT content from IDW, the better! And speaking of TMNT…oh, here’s Chloe! Sarah photobombed last time…apaprently it’s Chloe’s turn! She did not care that I was taking photos for this blog…she saw me there, and insisted on some attention! 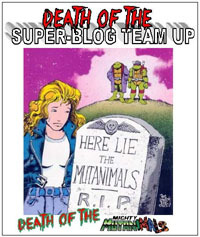 So, speaking of TMNT…I don’t even know what to make of this Rise of the TMNT cover. And despite virtually everything else published by IDW having at LEAST one variant, I don’t believe these have had variants. 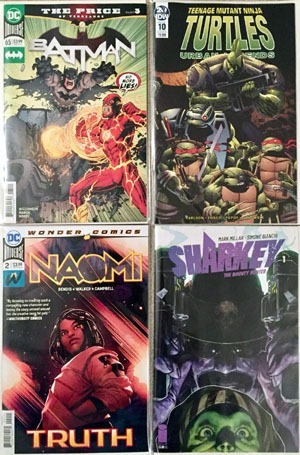 I don’t really care about this series…but have to admit to the “habit” aspect, and knowing that it’s still actually TMNT content, and I’d kick myself if I had to “hunt down” “missing” issues later, so I’ll just get ’em as they come out and be done. 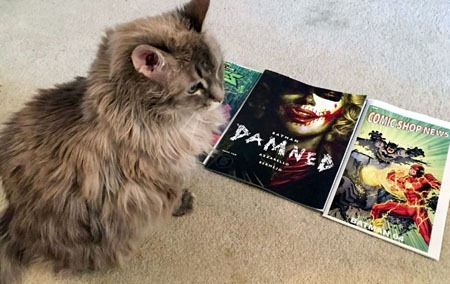 Finally…after however many weeks/months, we get the second issue of Batman: Damned. [ok, it’s been 12 weeks since #1 came out.] 12 weeks…3 months. I don’t remember the original schedule, but I think this is at least a MONTH late, maybe 6+ weeks. 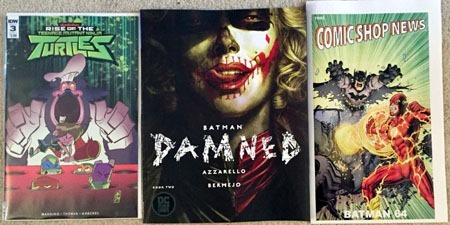 I got the first issue out of curiosity—DC Black Label, a new Azzarello/Bermejo piece involving the Joker; the magazine-sized format…and if it wasn’t for all the stupid online “HYPE” I never would have even noticed a certain anatomical portrayal graphically present. Having the first issue and not hating it, I got the second issue; and as I believe it’s to be a 3-issue thing, I’m quite likely to also get the third/final issue as well. Along with these issues, I also during the week snagged the Thanos Mighty Mugg figure from Hasbro. I’ve previously passed on all of these due to how small these are compared to the original line as well as not caring for the “gimmick” of the multiple faces. 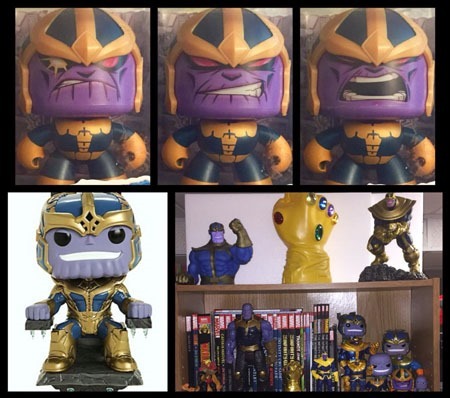 But hey…this is Thanos, so I went ahead and got it. Aaaaaand that’s about enough for this week. 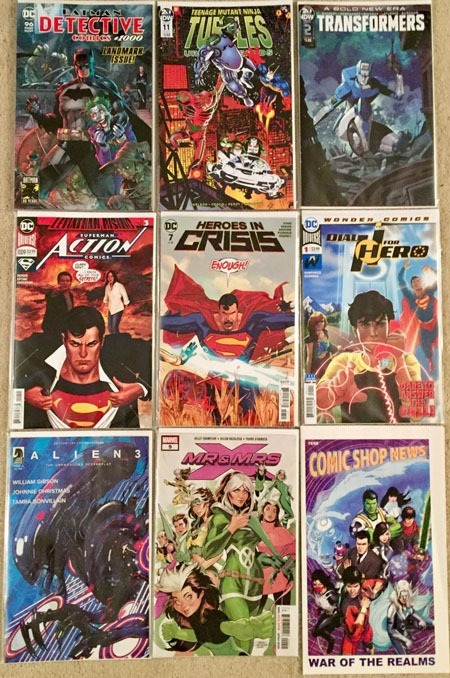 Two more New Comic Days for 2018…that means this was the 50th. And the final will be “interesting,” falling as it does the day right after Christmas…I’m not even sure what (if anything) will really be out that week or if it’ll warrant its own trip to the comics shop(s). Time will tell…and we’ll see what the week of the 19th holds! Even a should-be-small week can get big pretty quick. 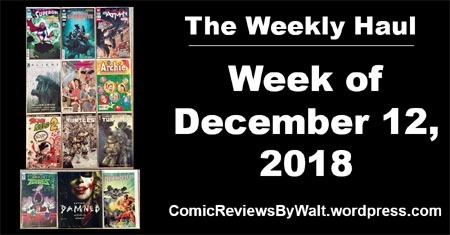 But this was definitely a worthwhile week…all the more after some apparent worries that "New Comics Day" would be Thursday due to holiday and distributor stuff! 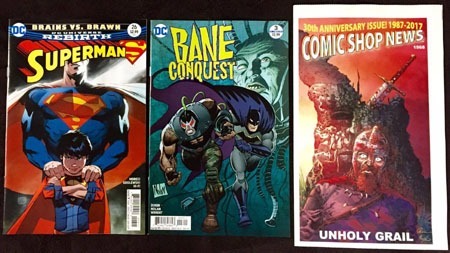 As far as actual new comics go, definitely a small week, with the new Superman issue and Bane: Conquest, which I almost didn’t get, but since it’s not billed as Rebirth and isn’t part of a bundle, might as well keep up with it in the hopes I get to reading it before collected editions are out. And it’s kinda hard to believe Comic Shop News is celebrating 30 years! I remember when it was still relatively new, back in 1992 or so. 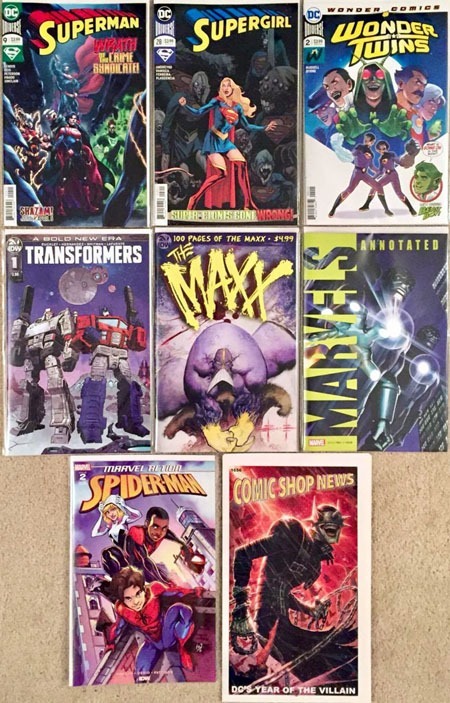 One of these days I’ll get all my issues together and sorted, an have a post for that…especially as I suspect I’m a weird one in the stuff I’ve actually saved over the years…including scattered issues of this! Then there’s the books from the bargain racks. 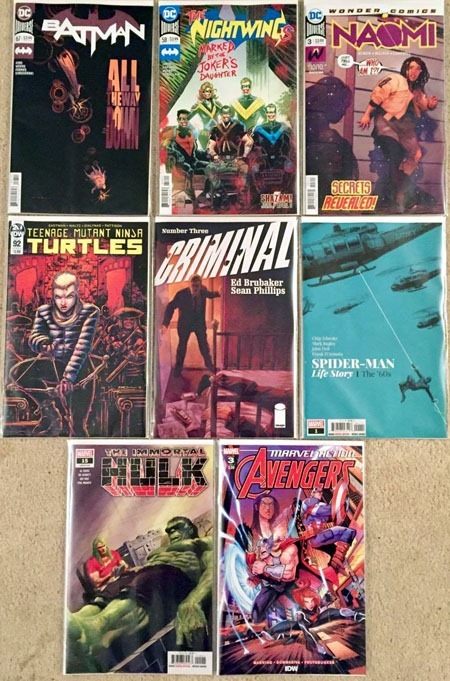 For the price of 3 standard Marvel comics, I got each of these Bizarro hardcovers. And the Wolverine: The End was…the price of a current standard Marvel, but with 6 issues, far more worthwhile! 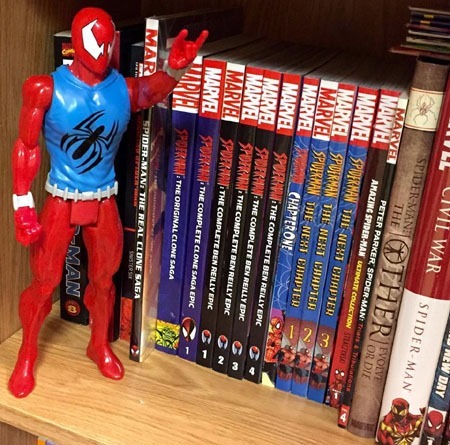 And I’ll close off with a random picture of my "Titan" Ben Reilly figure now out of the packaging and on a shelf. I’ve long resisted most of these figures…but for being bigger (albeit less poseable), they’re way cheaper than the much smaller figures, and I’ve given on on some characters here and there. I think I have Spider-Man 2099 somewhere…might start a Spider-Men collection. Or not, and just enjoy what I have.